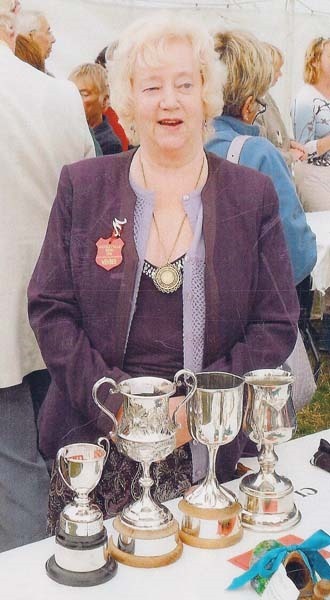 The funeral service for Margaret Knowles took place at SS Peter and Paul R C church in Leyburn on Thursday, March 13. She was the wife of Tom Knowles, the founder president of the Association of Rural Communities, and was a member of the association since it began. She was a popular Dales’ lady who had lived her whole life in the Aysgarth and Leyburn area. 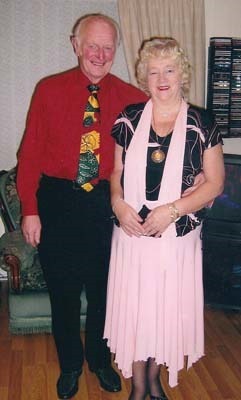 Her grandchildren especially remembered her for providing an important support centre in their lives. As her granddaughter, Sarah Jayne Mitchell read her family tribute to this “beautiful lady” Margaret’s other grandchildren joined her and held candles in memory of her. Margaret, who was born in May 1936, was one of three children of Horner and Alice Lambert. She attended West Burton primary school and then Yorebridge Grammar at Askrigg. She met Tom at a National Farmers’ Union dance in Leyburn in 1953 and they married in 1955. In April 1958 the couple moved to a small dairy farm at Westholme, Aysgarth. Soon afterwards the then vicar of Aysgarth, the Rev John Benson, asked if they would be prepared to allow boy scouts to camp there for two to three weeks a year. This led to Margaret and Tom developing the farm into a very successful, well landscaped site for caravans and tents, which was also used by those taking part in the Duke of Edinburgh award scheme. In 1988 Margaret and Tom moved to Grayford near Carperby and established a thriving, successful bed and breakfast business with a restaurant. And yet again Margaret’s cooking was a big attraction. Sarah Jayne said that her grandmother had been crowned Needle Queen at a national competition in London in 1972 and had gone on to become very well known over numerous years for winning cups, trophies and prizes at the Spennithorne and Harmby Village, Wensleydale, Reeth, and Muker shows for her knitting, crochet, dressmaking and baking. And last year in BBC2 ‘s Country Show Cook Off a celebrity chef was shown at the Wensleydale Show sneaking a piece of her prize-winning savoury tart to try and find out why his was only ranked third. Sarah Jayne told the very large congregation at the funeral: “Grandma taught us (that) family is an important support centre to our lives. We are told constantly that our beautiful family is so unique – that is because we have excellent role models. Margaret and Tom had three children – Carolyn Bowe (who died in 2003), Jacquie Dinsdale and Tony Knowles as well as 13 grandchildren and eight great grandchildren. Father Pat O’Neill officiated at the funeral mass and the bearers were her grandsons – Paul Knowles, Stephen Bowe, and Keith, Stuart, Ryan and Chris Dinsdale. The collection of over £1,140 will be shared between Herriot Hospice Homecare and Marie Curie Cancer Care. Close family at the funeral: Tom Knowles (husband); Jacquie and Roger Dinsdale (daughter and son-in-law); Tony and Barbara Knowles (son and daughter-in-law); Rene and Stephen Hillary (sister and brother-in-law); Arthur Lambert (brother) with partner Eileen Richardson; Maurice and Margaret Knowles (brother-in-law and sister-in-law); David and Fiona Bowe (son-in-law) and grandchildren: Michelle and Andy Craggs with Harry and Olivia; Sarah Jayne and Kevin Mitchell with Zakk; Stephen Bowe; Helen Bowe; Keith and Mabel Dinsdale with Farah; Stuart Dinsdale with partner Angela Lambert and sons Jack and Charlie; Ryan Dinsdale; Lindsey Dinsdale and partner James Yeadon; Chris Dinsdale; Diane and Andy Barker with Alfie and Dylan; Susan; Samantha; and Paul Knowles. Plus many nephews and nieces.